"Hardy Facepaint is awesome! It lasts the whole hunt without smearing, doesn't harm your skin, and comes off in seconds." "We love HARDY Facepaint. It didn't smudge, was dry to the touch and wiped off easy with a wet rag. No smear either. Really great product!" Cooper Cobb said he can't even go outside to play in his duck blind without his HARDY Facepaint on! "My two boys, Kai and Kaleb, are obsessed with baseball and have to have the perfect uniform for each game. I tried Hardy Facepaint and instantly fell in love. Not only is it safe for my boys sensitive skin, but it was not messy and didn't smear like all the other eye black's I have tried. At our last game, I was singing you all praise because we wore our Hardy Facepaint to the game and had to go to disney on ice right after, one quick wipe and not a single bit of black on Kai's face for the show.....I love this stuff it's amazing!" Application was simple and quick. No need to go over a place I already applied. Look: deep black which makes perfect breakup. Solid and not fading. Durability: INCREDIBLE! Splashed water on my face to test for sweat and rain. No runs. No fading. Excellent product. My face didn't feel burned after removal. "I ordered the HARDY face paints after looking for a non allergenic product for my son. He has severe egg and peanut allergies. After contacting and explaining our situation both Brian and Mariah contacted me to confirmed they rechecked for allergens. Rechecking confirmed it was free of these allergens I ordered 2 tubes. A test patch confirmed no reactions. He put some on his face before his shower. No reaction and was waterproof in shower but washed off with a good scrubbing! Fantastic! He is very excited to use the HARDY face paint for both his baseball and football seasons, as well as in the duck blind this season! Brian and Mariah a great team that offer a great product with caring customer service! Please follow and support!" 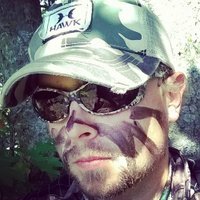 "If you like to use face paint when hunting, try @HardyHunts Hardy Facepaint. Wonderful product that works!" "Had a great turkey hunt. Hardy Facepaint is the real deal. I forgot I was wearing it and the turkeys had no idea either. Once you try it you will be hooked. It really keeps you in the dark." "HARDY Facepaint is truly is the best face paint that I have ever used. It goes on easy and lasts all day. I have worn it for all day hunts and it does not smudge or come off even when it is warm. It allows me to stay hidden and free from wearing a mask. And at the end of the day, it wipes right off with a wet cloth." "Mr Hardy you make the best face paint I have ever used. I really like how it just peels off and doesn't smear at all..doesn't have any scent either. I wanted to thank you for sending me a second bottle due to the other one being busted in shipping. I was able to still use the other bottle and do not go into the woods without painting up. Absolutely love this stuff. Going to convert all my buddies to this stuff thank you so much!!" "I'm sold! This stuff is awesome! So glad it came in time for opening day! I love it and I'm glad I tried it! Thanks for making such a great product!"